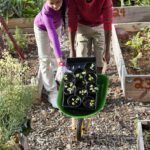 Using gardens to teach math makes the topic more engaging to kids and provides unique opportunities to show them how processes work. It teaches problem solving, measurements, geometry, data gathering, counting and percentages and many more aspects. Teaching math with gardening gives kids hands-on interactions with the theories and provides them with a fun experience they will remember. Some of the most basic everyday concepts start with mathematical knowledge. Gardening affords a way to instruct in these basic ideas with an inviting and entertaining environment. The simple ability to count as children decide how many rows to plant, or how many seeds to sow in each area, are life-long lessons they will carry into adulthood. Math garden activities, such as measuring the area for a plot or collecting data regarding the growth of vegetables, will become day to day needs as they mature. Using gardens to teach math allow students to immerse themselves in these concepts as they pursue the development and growth of the garden. They will learn about area as they graph out the plot, planning how many plants they can grow, how far apart they need to be and measure distance for each variety. Basic geometry will prove useful as children contemplate shapes and the design of the garden. Use math in the garden as a curriculum tool to help kids understand how math is applicable to life activities. Provide them tools such as graph paper, measuring tape, and journals. Assign projects such as measuring the garden area and arranging shapes to plan the growing space. Basic counting exercises start with counting the number of seeds planted and counting the number that sprout. A great exercise to teach math through gardening is to have children estimate the number of seeds inside a fruit and vegetable and then count them. Use subtraction or fractions to examine the difference between the estimate and actual number. Algebra formulas teach math in the garden when used to calculate the correct amount of fertilizer to add to water for the plants. Have students calculate the volume of soil needed for a planter box using geometric functions. There are numerous opportunities to teach math through gardening. Teaching math with gardening doesn’t have to be a large scale production and can be useful in small ways. Have children plan out a garden even if there isn’t space to implement it. They can color in their garden vegetables on a graph after they have completed assigned exercises. The easiest lessons to learn in life are those in which we enjoy participating. TomatoesAre Blight Infected Tomatoes Edible?